To review a completely new band is always hard. Especially if the band has no history or famous members and no prior music releases. Heart Of Stones are such a band. They started out in 2007 in Stockholm, Sweden, has one demo to their name, Echoes Of PICD and has made somewhat a name for themselves in the live scene in Stockholm. But, it has to be mentioned that most of their gigs has been acoustic, sitting down in some small pub. Never the less, I have caught them on several occasions and they always make for a great hour or so, acoustic or electric. My first acquaintance, however, was at an electric gig. I went with some friends and as Heart Of Stones comes from grunge – and me and grunge has never been the best of friends – I was hesitant to say the least. But being the open-minded person that I am (hmm…), I decided to listen without any prejudge. Even though their stage act wasn’t that much to write home about, the music sure did the talking and even though the grunge influences shone through – guitarist and lead vocalist Markowicz borrows a whole lot from Eddie Vedder – there was something catchy, something that jumped outside the grunge box that really appealed to me. Of course, with only four guys and an acoustic guitar (even though electrified) based set, the music were raw and stripped. But it was the melodies that got to me. Some songs left me humming them for a while after the gig and some of those songs only went under working names at the time. So when the band – Markowicz (guitar, lead vocals), Vezzoli (guitar, backing vocals), Lateralus (bass, backing vocals) and Samadhi (drums) – decided to finally put their music on CD and sent me a copy to review, I was extremely curious of how their music would sound in a studio. Would they go with the stripped down sound of their live gigs or would they go electric and more heavy rock? The album was a long time coming for sure so they sure have had the time to add, remove or refine their sound. If you want to keep things as a surprise, I suggest you stop reading now because what I’m gonna write next will be a major spoiler. After have only heard the band live, listening to them on CD for the first time was close to a huge shock. Usually, grunge is kept in a tight frame, musically and especially sound wise – there’s not much room for thinking outside of the box, in that respect that a grunge band would never in a million years get caught with a “Livin’ On A Prayer” kind of chorus. I’m not gonna say that Heart Of Stones has written a Bon Jovi tune, but that box is not for them apparently. Their box has swinging doors all around and they hardly spend any of their time in said box at all. To tell you the truth, I didn’t expect their album to sound like this and I was completely blown away already by the first listen. 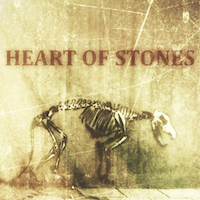 But mind you, if you’re after a metal or hard rock – or even an Alice In Chains or Pearl Jam kind of record, then don’t bother with this because Heart Of Stones is a different kind of beast. They go with the more mellow and laid back stuff. But don’t worry – and I promise you this – they never get boring or dull. As in never EVER. At least not on these six tracks. Opener “Geir” is brilliant – an uptempo song with a dark pop vibe and a beautiful production and a really catchy melody. “Mental Breakdown” is a fantastic ballad with a melody that totally kills with a huge sound scape that is all over the tune like a warm blanket. The verse is one of those that Dave Pirner of Soul Asylum would have sacrificed his right nut to write, while the chorus just brings the song up to another level. On the downside, this song ends a bit abrupt – I would have wanted this one to be one of those big epic 8 minute tracks or something like that. “Death Of The Sirens” was the first track that I noticed while watching them live. It has this extremely catchy chorus, the kind that makes you wanna throw your hands up in the air and headbang a little – even though the song isn’t a headbanging track at all. But in my book, this is their hit. It’s more uptempo and more electric than the rest. But if I can be a little picky, then I would have wanted a bit more attack and bite in the chorus, but that’s trivial because it is a chorus to die for. “Hurricane” has a riff that’s reminiscent of Monster Magnet’s “Space Lord”, but this one is based on acoustic guitar. It’s dark, heavy, aggressive – and emotional – awesome stuff. “Coming Back” is real mellow, but at the same time very catchy. It has the sound of the 90’s, but I hear a glimpse of David Bowie’s “Heroes” in there, probably unintentional, but I can also hear traces of U2 and Tool. Just to make things even more confusing, the production here is so big and huge that I think of Def Leppard. Def Leppard’s “Hysteria” is also in the opening guitar, both in sound and the way it’s played. Schizophrenic? Not in the least – everything sounds totally natural. Oh yeah, the song is bloody fantastic as well. But they have saved the best for last. I find all the tracks here equally as good, but “Photography” has a melody that gives me goosebumps and the production here creates a sound scape so beautiful and so unpredictable. You just don’t know where this song will go. It starts out as a ballad, soft and beautiful and it ends in a crescendo of sounds and emotion. It’s almost as if you can see the colours of the sound. I know that might sound a bit pretentious, but that song can move mountains, make no mistake. This is just mind-blowing – and I am impressed. Very impressed. It should also be mentioned that Markowicz’ palpable Eddie Vedder influences are almost completely gone here, leaving him with his own voice and style – and he’s a lot better for it. Also, his English is really good. I can’t hear any accent at all. Producer Simon Sigfridsson must also get name checked here as it is he who has guided the boys through all this and he’s responsible for the sound here. That guy is a genius. I had never heard of him before this record, but I hear he’s working with Swedish po band Kent now – and they’re huge – at least in Sweden. Hopefully his name will be everywhere in the near future. But there must be a downside to this as well, right? As for the quality of the songs and the production – nope, none whatsoever. But when I find music this awesome, only six songs almost pisses me off. Sure, this is a mini album or an e.p., but I hate those. I’m old school and I want an album – 10 or 11 tracks or something. Still, if shortage of songs is the only thing to complain about, I guess someone has done something very right. There are some great musicianship dwelling in these guys and just to avoid any adulation here, I must say that it is a difference between giving a six track album a 10/10 review to an 11 track one, but that doesn’t take away the greatness of the songs that ended up here. This album has yet to have a physical CD release, but it should see the light of day this spring. However, you can find it on Spotify and on iTunes – and my guess is that you’ll might find it on YouTube as well. You can also visit their web site http://www.heartofstones.com. Whatever your choice, do yourself a favour and check this out. Sounds like a band to watch out for in the future. Very promising album and I’m amazed they are not signed already! !